Make delicious wood-fired dishes in your backyard. This outdoor pizza oven heats up to 900+ degrees in a flash (literally, less than 10 minutes). You’ll have a restaurant-caliber pizza in two minutes and charred veggies and meats in under five. Foodies love this powerhouse. Dimensions: 29" x 26" x 14"
I received this as a Christmas gift. After a few weeks, we’ve made pizza three times and a steak once. I live in Maine, it’s 18 degrees outside, and the Uuni oven is awesome. I read various reviews, focusing on the few low rankings. All I can say is that those folks who don’t like the Uuni are missing out. It’s not very hard to get the oven up to temperature. An infrared thermometer is extremely useful in checking temperatures. I know I have much to learn, but we had wonderful Pizza each time right from the start. Tonight we had a steak. I had the oven very hot, over 800F, when my wife said we needed to wait 15 minutes. Fine, no problem, I set a timer and came back 10 minutes later. The pellets had burned down, so I added pellets and within a few minutes the temperature was back up to 800. I used a cast iron skillet, preheated, and cooked the steak 2 minutes a side. The flavor was fantastic. FINALLY an Outdoor Oven that does Pizza right! Made AMAZING Napolitano style pizzas for my family, delicious, quick and wow!!!! Get one!! Uuni Founder Kristian Tapaninaho first created smartly reinvented wood-fired pizza ovens back in 2011, when he wanted to take his made-at-home pizzas to the next (easier and tastier) level. This stainless steel oven is sized to cook a variety of high temperature dishes, like casseroles, meats, roast veggies, and even loaves of bread. And it runs on charcoal, wood, or wood pellets. 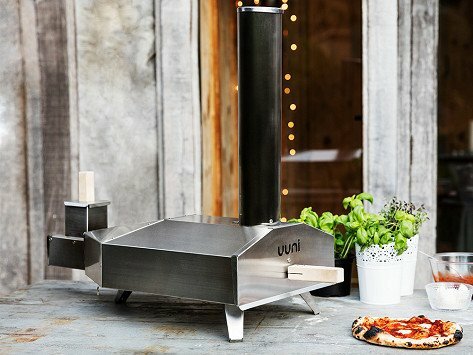 We’ve been fans of Uuni’s deliciously fast pizzas from the get-go, and we think foodies, hosts, and even culinary beginners will appreciate how this updated oven elevates even the simplest backyard meal.